I wish I had known about prediabetes and had the chance to change my lifestyle before I was diagnosed with type 2 diabetes. I now know that many of the niggling symptoms I was experiencing in the years leading up to my diagnosis were warning signs. I think in my heart of hearts I knew I was likely to develop the condition – I used to avoid reading about diabetes even though my paternal grandmother went blind with type 2 diabetes. In addition, I had been slightly overweight for years and I was (and still am) the typical diabetic apple shape with skinny arms and legs and a waist measurement well over 31cms. People used to ask me if I was pregnant because I looked relatively thin with a very rounded, swollen stomach. I used to tell myself it was bloating caused by bread, veg or soda, and tried to ignore the adverts everywhere shouting that my body shape put me at high risk. If you are tempted to turn away too – don’t! If you are prediabetic (also known as borderline diabetic) the good news is that if you tackle your fears and make even small changes to your lifestyle there is a chance you can slow down or even completely avoid developing full-blown type 2 diabetes. So what are the risk factors and symptoms of pre-diabetes? The main give-away is that your healthcare provider might have advised you your blood glucose (sugar) levels are higher than is considered normal, but not yet at a level classed as diabetic. Having a close relative, like a parent or brother or sister, who has diabetes. Having given birth to a baby that weighed over 9lbs. Having high blood pressure and/or low “good” cholesterol or high triglyceride (blood fat) levels. 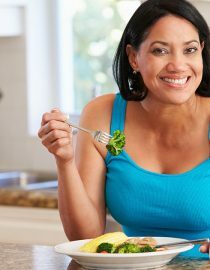 Some groups are genetically more prone to prediabetes and diabetes, including Native Americans, Afro-Caribbeans and South Asians, but prediabetes can affect anyone of any age, gender or race. Tick a few of those boxes? Don’t panic – making a few changes to your life will benefit your health generally and could even prevent you developing Type 2 diabetes at all. Next page: how to decrease your risk of type 2 diabetes.